Sndgems is qualified to perform virtually any jewelry revitalization you may require, and our experience in this area is considerable. We will gladly work with individuals to meet their specific needs...or with professional shops seeking reliable, high-quality repairs for their clients. You may rely upon Sndgems goldsmiths to accomplish the most delicate of restoration procedures, whether on jewelry or watches. Our reputation for expert execution is unsurpassed. We have certified gemologists and professional jewelers and it is their our duty to provide the finest workmanship around. Any precious metal jewelry can be redesigned or repaired. 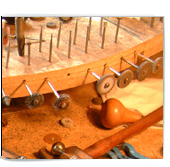 Everything from clock repairs to ring sizing to fine designer re-mounts. Most repair work generally requires one week and is unconditionally guaranteed. All at rock bottom prices! 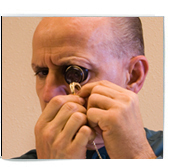 In addition to fine jewelry repair work... we are also qualified watch repair specialists. Check jewelry every 6 months as prongs can wear thin and let stones fall out. Chains and pearl strands weaken with wear. Ring shanks wear thin through time. Before disaster strikes, have your jewelry professionally inspected and repaired. No job is too large or too small, and estimates are provided. Active outdoors types, for example, might be better off avoiding the marquise or pears shape. The shank as well as the prongs of a ring worn daily by a very active person will show the effects of wear. You can be assured that Sndgems will provide you with all the information you need to make a jewelry purchase with the utmost confidence.